For me, landscape is a metaphor for my aspirations, imaginings, moods and memories; it provides the spur or experience that pushes me into a ‘cusp’ area, beyond my comfort zone, into a heightened, magnified experience. Out at sea, on the Breakwater, the landscape is less an extension of myself, but an external force to be worked around, negotiated. This inverse relationship is what I try to convey in my work, the duality or schism between experience and observation. The physical mass of the Breakwater and its solid presence within an unruly and wild environment has become a symbolic manifestation of that edge between states; inaccessible and abject, yet once strolled along and admired, over the course of many visits, it grew utterly compelling. Mindful of the lack of public access to this mile-long length of granite, I recalled historical images depicting day-trippers taking the air along its length and the physical oddness of walking surrounded by the sea. I‘m particularly interested in the way that humans negotiate spaces through walking and in this particular location, the absurdities surrounding walking in a forbidden place, cut off from land. The iterative nature of the documentation; both swimming, climbing and walking reflects a cumulative knowledge and growing sense of the structure and its impact on the environment around it. As I have spent more time out on the Breakwater, I have become increasingly aware of the ghosts that stalk its length; promenaders, fishermen, bathers and picnickers all jostle in my imagination with its great engineers Rennie and Whidby; souls of stricken vessels and uncanny sea-creatures, even the imperious visitors or voyeurs, Queen Victorian and Napoleon. What was it like to walk this structure in 1837? The Breakwater is one of many historical structures that the Ministry of Defence has responsibility for yet cannot grant open public access to. 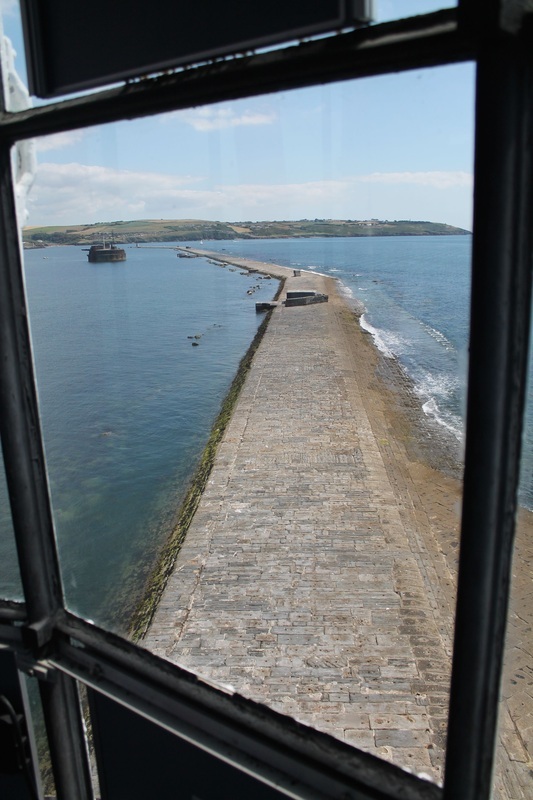 I initiated a collaboration with the Queen’s Habour Master authority, based with 30 Commando in Stonehouse Barracks in Plymouth and secured permission to access the breakwater and document the walk along its length over a period of several trips. Many thanks to CPO (CIS) Mike (Jase) Donovan and Mary Brooks from Longroom for helping me to realise this project, as well as Vickie Fear and Caroline Mawdsley at PAC.